2 Burke, Bernard, Genealogical and Heraldic Dictionary of the Peerage and Baronetage of the British Empire, London: Harrison and Sons (1865), 1100, Google Books (Digital Library). 3 Fetherston, John, ed., The Visitation of the County of Warwick in the Year 1619: Taken by William Camden, Clarencieux King of Arms, London: MItchell and Hughes, Printers (1877), 126, Internet Archive (Digital Library). 4 Metcalfe, Walter C., The Visitations of Northamptonshire Made in 1564 and 1618-19: with Northamptonshire Pedigrees . . ., London: Mitchell and Hughes (1887), 173, Internet Archive (Digital Library). 5 O'Brien, Jennifer, "Robert Catesby", (accessed 11/01/2017), Britannia Biographies, www.britannia.com. 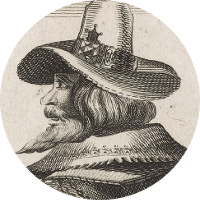 6 Wikipedia, "Robert Catesby", (accessed 11/1/2017).